First Year Computer Science students receive an intensive Introduction to Programming with the October Java Coding Bootcamp. 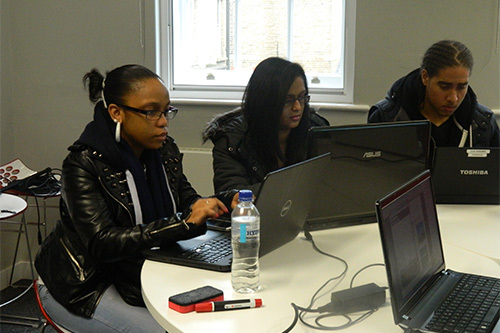 City's First Year Computer Science students started the academic year with a difference. From 30th September to 11th October, they underwent an intensive Introduction to Programming Bootcamp using the Java programming language. 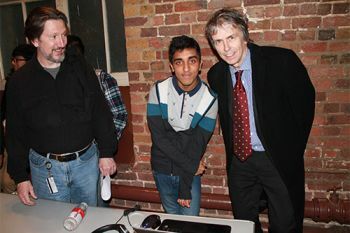 The Bootcamp followed an informative induction session at the Science Museum on 26th September which featured a lecture delivered by Oxford University's Dr Andrew Hodges, on the life and career of eminent mathematician, cryptanalyst and computer scientist, Alan Turing. During that session, Professor David Stupples, Professor of Communications Systems and Cryptography also spoke about the significance of the Enigma machine which was used for breaking enemy codes during the Second World War. The Java Bootcamp provided a buzzy, immersive space for students and instructors to explore the joys and challenges of coding. 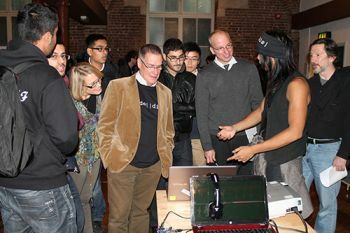 The students' programming projects were judged during the final session at The Crypt on the Green, St James's Clerkenwell on 11th October. George Goodsell, Narula Raghav and Subhan Rehman emerged among the outstanding Bootcampers. Narula Raghav coded a program which downloads a list of up to date news articles from the BBC News website, generating unique keywords for each article which can be used as filter parameters on a Twitter update feed. When the data is downloaded, articles and their popularity can be represented on screen by coloured bubbles and circles. "The size of the bubble will grow in real time as tweets about the articles occur. If it was a re-tweet rather than an original tweet, the size of the blue circle around the bubble will grow. You can click on a bubble to view the article's tweet statistics at the bottom, then click on the text at the bottom to load that article in a web browser. The size of the bubbles also affects the way the collisions with other bubbles occur; larger bubbles being modelled as 'heavier' and therefore having a greater impact on collisions with smaller bubbles. The idea is to show at a glance which articles are popular but also make them stand out when certain articles generate more interest than any of the others." In future, Narula hopes to develop his program into a more universal analytical tool with the functionality to permit users to decide "who is the most influential in spreading the news within online communities". "The aim of the Bootcamp was to give incoming students an immersive approach to the new 'language' they were learning. We believe that a total focus on one thing for an extended period of time would give them a solid foundation in one of the fundamental skills necessary for a computer scientist and that we could then build on this for the rest of their time with us. Judging by the impressive applications the students have produced for the end of Bootcamp exhibition, we've succeeded wonderfully and all of our incoming students are already able to program and ready to launch into the next set of challenges". "Walking into the vaulted brick Crypt on the Green on a wet Friday afternoon, I immediately sensed the buzz of enthusiasm as first year students explained and demonstrated the code they wrote as part of their two week Introduction to Programming Bootcamp. The results were truly impressive. I am absolutely delighted that City's School of Informatics initiated this project. Learning to code is a fundamental skill which encourages us to think in a highly creative and logical way. Bravo to all who made this such a success".